Halloween is complicated, especially for women. Halloween is often referred to as the national gay holiday and certainly it’s the holiday many of us love most. Unconnected (now) to the complications of organized religion or to families of origin, Halloween has always felt like our own, where we could dress as we liked and take on the persona we wanted without anyone raising an eyebrow. Halloween was the one day of the year we were free. Halloween is complicated, though, especially for women. The history of Halloween–All Hallow’s Eve, the night before All Saints Day, when the souls are said to freely walk the earth–is fraught for women. That iconic costume, the witch, is also a symbol. Women were the ones associated with witchcraft, which was heretical. Women were burned at the stake, pressed to death, drowned, hanged. Feminist theorist Andrea Dworkin wrote about "Gynocide: The Witches" in her groundbreaking book Woman Hating in 1974. When I was in college and the host of the nation’s first lesbian radio program, Amazon Country on WXPN-FM in Philadelphia, every year for the Halloween show I would read from Dworkin’s documenting of how women’s–and especially lesbian–lives were snuffed out in a holocaust of witch-burning. As she wrote, "Witchcraft was a woman’s crime." Dworkin estimated the number of witches killed during what is referred to as "the burning times" at nine million over 300 years. Dworkin and other feminist theorists and historians have always maintained that woman-hating/misogyny was at the core of branding women as witches. Being labeled a witch meant a woman could be tortured and killed, usually because she didn’t ascribe to her mandated role or who disobeyed the patriarchal systems of the time, notably the Church and the Crown. While some men were also tortured and killed as witches, male and female historians agree that women outnumbered the victims of the European witch craze 100 to 1. The killing of witches was not, regrettably, relegated solely to the Dark Ages or even the centuries where it reached its apex in the 15th to 18th centuries. Witch hunts and killings continued well into the more enlightened eras, making their way to the American colonies. Witch hunts and killings are still being perpetrated today in Africa, Asia and South America. Throughout the 1980s numerous women in the U.S., some of them lesbians, were accused of satanic ritual child abuse at day care centers. One of the most notorious of these cases was that of Kelly Michaels, who was indicted on 299 counts related, basically, to witchcraft in 1988 in Maplewood, NJ. Michaels was sentenced to 47 years in prison and served five of those years before a successful appeal in 1993. Assertions that women are witches has never stopped, however. On Oct. 17, in India, Debjani Bora, a national gold medalist in the javelin and an Olympic athlete was accused of witchcraft. BBC reported that Bora was so badly injured by the accusations that the athlete fears she might not be able to participate in an upcoming Asian sports competition. According to BBC, Bora is far from alone in being accused of witchcraft. Witch hunts targeting women are common in parts of India and a number of those accused are killed every year. According to police reports, Bora was attacked by a mob that dragged her forcibly to a community prayer hall where a "public trial on charges of being a witch" ensued. Bora was accused of being responsible for the deaths of four people in her village, including that of a man who committed suicide. Bora’s account of her ordeal is harrowing. She was lucky to escape with her life. At a press conference, Bora told reporters, "Instead of finding out why all the deaths occurred, some village elders suspected a witch was driving the people to death and organized a prayer. As the villagers were chanting hymns, one elderly woman identified me as the witch and shouted that I should be punished," she said. "I was blamed for all these deaths in the village, wrapped up in fishing nets and beaten up severely." Bora was beaten unconscious and had to be hospitalized. Indian police report that in the last five years nearly 100 women have been beheaded, burned alive or stabbed to death after being accused of witchcraft. Salem, Massachusetts is the site of America’s own "witch craze." In 1692, 19 witches were hanged on Gallows’ Hill–14 of them women. Another 22 women died in prison after having been convicted of witchcraft, and two infants born to the "witches" in prison also died. More than a dozen other women were tried but not convicted and several were named but not arrested while still others were named but not indicted. One woman was released from prison after the witch trials ended. The death warrant for those convicted witches read "for the horrible crime of witchcraft perpetrated upon several persons." The women pleaded “not guilty,” but that did not save them. The dead "witches" are memorialized in Salem with both the Salem Witch Museum and a memorial called "The Stones," which is quite moving. The Memorial consists of 20 rough-hewn granite benches cantilevered from a low stone wall surrounding an area adjoining the Old Burying Point. The benches are inscribed with the names of the accused and the means and date of their execution. For more than 40 years Salem had its own "official witch of Salem," Laurie Cabot, a strong friend to the LGBT community there. Cabot, who practiced the Craft and raised her daughters as witches, even served as a consultant on the iconic TV show Bewitched. In 2012, at the age of 80, Cabot closed up her witch shop and retired. Her memory and followers live on and witchcraft remains a thread that runs through Salem, past and present.. 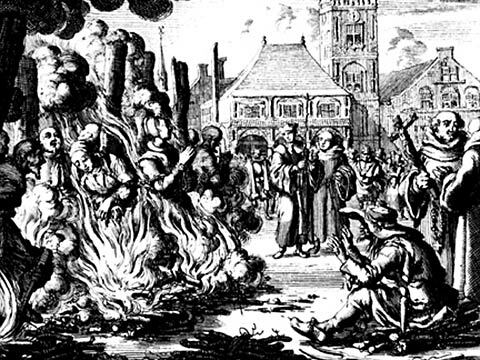 The Salem Witch trials are often cited as an example of religious hysteria in the colonies. Yet more than 300 years later, women–often lesbians–are still being sentenced to death for witchcraft and sorcery, some being burned at the stake, others being hanged, some beheaded. Last August, The Atlantic published an in-depth piece on Saudi Arabiain which it revealed that women were being targeted by the country’s religious police force, the Committee for the Promotion of Virtue and the Prevention of Vice (CPVPV). Ryan Jacobs’ shocking report begins provocatively, with a naked "sorceress" attempting to escape through a window. She was reported to have flown like a bird and Islamic clerics who tried and sentenced her said this was a known trait of witches, Al Aribya reported. The Atlantic detailed how in 2009 Saudi Arabia established a special Anti-Witchcraft Unit. It’s no surprise that the majority of victims of this new unit are women, many of them domestic workers from other countries who are not Muslim. Saudi Arabia is a theocracy and only Islam is allowed. Women bringing their own religious beliefs with them from other countries are often viewed as witches. In May 2013, two maids were accused of casting spells on their employer and were sentenced to 1,000 lashes and 10 years in prison. Their crime: witchcraft. They were far from alone. According to Arab News, "at least 586 cases of magical crime, the majority of which were foreign domestic workers from Africa and Indonesia" were prosecuted in Saudi Arabia between 2009 and 2011. The London newspaper The Telegraph reported on Oct. 10, that seven women, mostly elderly, had been burned at the stake for witchcraft in Tanzania. A local healer was among 23 people arrested for the killings. Relatives of the victims said they had been hacked at with machetes prior to be burned alive. Witchcraft is also a crime in Gambia, Cameroon, Congo, Papua New Guinea, and Iran. In Dworkin’s "Gynocide: The Witches," she writes about witches being accused of making men’s penises disappear. In 2008 in Congo, police arrested 13 women as sorcerers, accused of using black magic to steal or shrink men's penises in the capital city of Kinshasa. Other surprises exist. Canada’s criminal code–section 365–makes witchcraft and sorcery a crime. As recently as 2010, two women were charged and sentenced for practicing witchcraft in Canada. Witchcraft is also a crime in some states in Australia. Witchcraft and the practice of Wicca has only been legal in the U.S. since 1985 when the U.S. Supreme Court ruled in Dettmer v. Landon. Fear of women who practice witchcraft or worship the Wiccan religion may persist, but in the U.S. at least, women reclaiming their witchy roots is a growing trend among female witches. Rev. Selena Fox, a practicing witch in Wisconsin, was quoted in the Huffington Post last week saying Halloween is a time to spread the word about who witches really are and to dispel the stereotypes that surround witches, witchcraft and Wicca. Fox told HuffPo, "although costumes can perpetuate stereotypes about witches, they might also offer an opportunity for discussion. Stereotyping can be hurtful to people who are involved in pagan religion." She added, "Some of the stereotyping in the past was used to torture and execute people. It was horrific propaganda." But Fox also said, "Depictions of the ‘evil witch,’ with her hat and broom, can offer an opportunity to talk about the true nature of Wiccan spirituality," noting "It can be a teaching moment." Lesbian witch Starhawk, who won a Lambda Literary Award for one of her many books on spirituality and Wicca, writes in Spiral Dance, "The word ‘Witch’ carries so many negative connotations that many people wonder why we use the word at all. Yet to reclaim the word ‘Witch’ is to reclaim our right, as women, to be powerful, to know the feminine within as divine....In the Craft, the cosmos is no longer modeled on external male control." Perhaps this is why witches continue to spook men as often as they did in the Dark Ages and are still being put to death in 2014, just like they were centuries ago. Which makes Halloween not just a time to celebrate our witchiness, but a time to memorialize all the women put to death as witches because they stepped outside the lines, whether they were witches or not, our lesbian sisters among them.